I’ve spent most of my career boiling down my trading to a few simple indicators that almost always produce winning trades. In fact, I believe there are only 4 chart patterns that you need to know to make money in the stock market. I’ve been interested in computers since I was a kid. In fact, my dad gave me a Commodore for Christmas one year when I was young. Much to his dismay, I promptly took the Commodore apart. I just wanted to know how all those pieces of hardware put together created this awesome computer. Ever since then I’ve designed, built, and tested so many machines that I’ve lost count. Through all of that research, I’ve learned what works and what makes absolutely no difference to your trading. There are three elements of the best stock trading computers that will consistently give you a winning result. I often call these three requirements the baseline of computer hardware requirements for traders. Anything less than these requirements and you are really just selling yourself short. A new machine that doesn’t meet these requirements is essentially swapping one problem for another instead of just removing computer issues from your trading altogether with the right machine. My buddy’s friend Brad was in the market for a trading computer. Brad shared with my buddy that he did a ton of research and found a few computers on Ebay that used “trading computer” in the description. He was on the fence but leaning towards getting the Ebay computer, until my buddy told him to check out EZ Trading Computers. 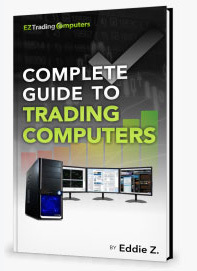 He downloaded my trading computer buyers guide (it’s free and you can get it here) and read about what benchmarking is and why it’s absolutely crucial to have a quality processor in a computer for trading. I explain in the guide that the minimum processor benchmark score for trading is 7500. He checked out the processor on the Ebay machine. It had a benchmark score of 1981!! That computer is way past its prime and he almost spent $1300 on it. In order to invest in a machine that is going to perform well for the next several years, you should buy a trading computer with an Intel i7 processor AND a benchmark score of at least 7500 – but the higher the score the better. There are two types of hard drives that you could install in your trading computer. The first is a hard disk drive or HDD. This is an older type of hard drive that uses rotating disks and magnets. Secondly, your other choice would be a Solid State Drive or an SSD. This type of hard drive has no moving parts and stores information in microchips. Primarily, the biggest differences in the two types of hard drives are speed and lifespan. A HDD drive has a load speed of 170 MB/s. In contrast, a SSD drive can deliver speeds of over 400 MB/s. Additionally, an HDD drive tends to have a lower life expectancy because it contains moving parts that can degrade over time. An SSD is going to provide you with much faster boot times and will effect how quickly your software loads. SSD’s tend to be slightly pricier than HDD’s. However, it’s worth the upgrade because it directly impacts the quality of your trading computer and you trading itself. At EZ Trading Computers, we only use HDD’s for data storage as a secondary drive. All of our machines have SSD’s as their primary hard drives. RAM is essential to a great trading computer. RAM is the short term memory of your trading computer. When you log onto your trading computer each morning and open your email, web browser, and trading software, you are placing a ton of demand on your trading computer’s RAM. Your computer’s RAM is a fixed amount. When you’ve used it all, it’s gone. Your computer freezes and spontaneously restarts. Once you run out of RAM there is no avoiding this. It’s your computers way of wiping the slate clean and attempting to accommodate all of your open programs again. In order to avoid this, traders need at least 8 GB of RAM. Trading software is heavy handed when it comes to RAM usage. Odds are, this trend will only continue as trading software evolves and becomes more complex. For this reason, I recommend that you install more RAM than you need. Often times, it’s only 100 bucks to double your RAM from 8GB to 16GB – a worth while use of $100. Recently, a new form of RAM, DDR4 RAM, was released. DDR4 is even faster than traditional DDR3 RAM. If you can stretch your budget for this upgrade, this is a nice feature to have as well. I hope that this information helps you buy the fastest trading computer that fits how you trade.